Article first published as Denver Breakfast Strata on Blogcritics. Weekends are the days I really look forward to making breakfasts. It's the time of week where I have some extra time to prepare something more than the usual toasted bagel or bowl of cereal/oatmeal. 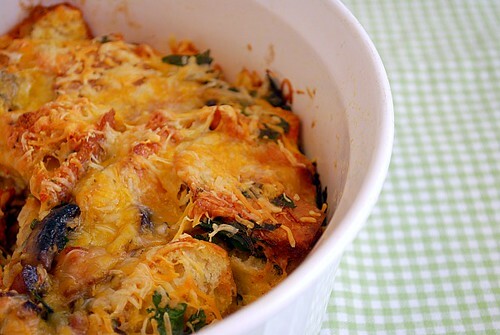 The most recent weekend breakfast I made was this Denver Breakfast Strata. I guess some folks may call this a breakfast casserole, but because the dish has various layers, it's best known as a strata. As you may have guessed, this strata is layered with ingredients commonly found in a traditional Denver omelet. Sautéed onions, bell peppers, mushrooms, diced ham and cheddar cheese fill this strata with tons of flavor for a satisfying breakfast! My husband will order a Denver omelet when we're dining out for brunch if it's on the menu. It's definitely his favorite breakfast above anything else. With this in mind, I was inspired to take all the things he loves about a Denver omelet and incorporate it into a breakfast casserole. This is a great dish to make for a crowd and is perfect for either a breakfast or brunch meal. Another bonus is you can make it in advance the night before and bake it the next day! Place the bread cubes on a baking sheet and bake in preheated oven for 7-10 minutes until toasted; cool. Once cooled, transfer half of the bread cubes into a greased casserole dish. Set aside the remaining half of bread cubes. Meanwhile, in a skillet, melt the butter and sauté the onions, peppers and mushrooms until softened. Layer the vegetable mixture over bread cubes. Top with half of the remaining bread cubes. Next, sprinkle the ham and shredded cheese in the casserole dish. Top with the remaining bread cubes. In a bowl, whisk the eggs, milk, mustard, salt and pepper. Pour over the bread mixture. Cover the casserole with plastic wrap and place a small plate on top to weigh it down. Place the casserole into the refrigerator to chill for at least 30 minutes or better yet, overnight, to allow the bread to absorb the egg mixture. Bake at 350 degrees F for 45-50 minutes or until puffed and golden. Remove from oven and allow to rest for 15 minutes before serving. I love the fact that this can be prepared ahead of time. looks really good! What's in a name... although I would also think a breakfast bread pudding. I can make it during the day and serve for dinner.